One man’s journey hiking the then-proposed path of the Keystone XL oil pipeline, from the Alberta tar sands of Canada to the Gulf of Mexico. After a stint as a dishwasher at Deadhorse Camp, a makeshift community of oil workers near the Arctic Circle in northern Alaska, Ilgunas (Walden on Wheels: On the Open Road from Debt to Freedom, 2013) realized that he was indirectly participating in the culture of oil dependence, and the subsequent industrial squalor he witnessed around him at camp, that he actively fought against. After a fateful if not disastrous hike to nearby Prudhoe Bay reinvigorated the author’s spirit for adventure and wanderlust, he quickly set about planning a symbolic trek along the proposed path of the contentious and, at the time, still-tentative Keystone XL oil pipeline. In 2012, he began in the tar sands of Alberta, Canada, and continued southward for 1,700 miles through the plains of America to the Gulf coast of Texas. 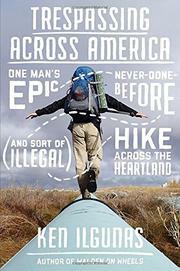 Along the way, the author, always following his free-wheeling philosophy (he has hitchhiked more than 10,000 miles across North America and canoed more than 1,000 in Canada), risked being shot by landowners for trespassing, battled niggling injuries and fatigue, and endured the harsh weather while sleeping outside. While rhapsodizing about the natural beauty of the environment, Ilgunas also injects his narrative with statistics, facts, and anecdotes about the global warming crisis (he quotes Wendell Berry, Bill McKibben, James Hansen, and others). Ending his journey at a refinery on the Gulf coast in Port Arthur, Texas, the symbolism of the author’s journey does not add up to the gravitas that he intended. While the narrative is heartfelt and seemingly genuine, Ilgunas’ multistate hike reads like an overextended think piece. An interesting and promising premise turns ponderous and occasionally preachy as the author narrates his cross-country trek.